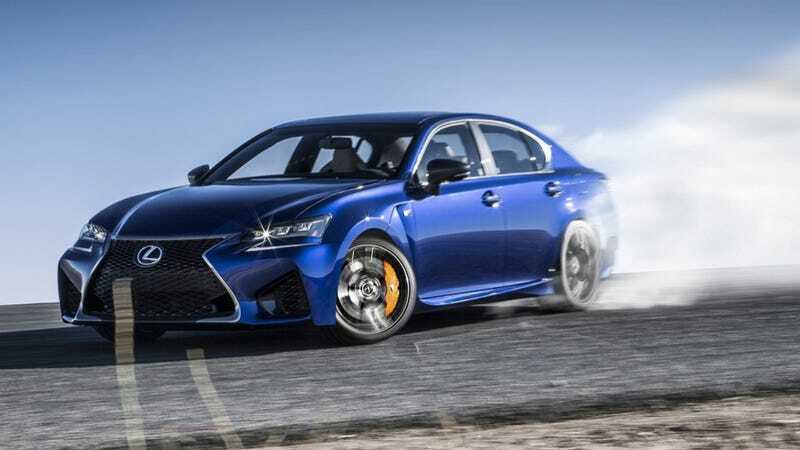 Being offered a free Lexus GS F for the weekend felt like being offered custody of the child of a distant relative who had just died. Of course I said yes, but deep down I wished it might just get lost before it ever got to me, because I have other things to do. Apparently the folks at Jalopnik thought it would be “funny” for me to review a Lexus, because such a grotesque example of luxury clashes with my stated political views. I do not know what is so “funny” about implementing a program of democratic socialism that might fully fund national transportation projects and render automobiles anachronistic. I suspect that I was also asked because I have a bit of a reputation around the office as a driving “guru.” I do not own a car, nor have I owned a car in more than a decade, but I drive rental cars several times a year, and have accumulated only a handful of criminal driving violations in my lifetime. Of the Lexus, I can definitively say this: it is red. The rest of it is a bit confusing. It has wheels that look like frozen spiderwebs and a grill that looks like a stretched basketball net and from the front it looks unforgivably garish. From the back it looks like some sort of Nissan. The interior is covered in what I believe to be leather, and the steering wheel, accelerator, and brake all functioned properly and without incident. One drawback of this car is that it seems to be filled with a great deal of things you do not need. When Jalopnik’s “Mike” Ballaban was demonstrating the car to me, he kept saying things like, “Here are your paddle shifters,” and “Here is the switch for eco-sport-mode.” If you think that I am the sort of person who is going to be fooled into paddle shifting you have another thing coming, Michael! The car features a dashboard that is in fact a computer, complete with lots of different menus offering options that I do not recall. If I wanted to deal with computers I would have been a computer technician rather than an auto enthusiast. There were also many buttons of different size and varying symbols arrayed all across the dash, and the armrest, and the wheel. Buttons, buttons everywhere. I do not recommend pushing any of them, as there is no way of telling what may happen if you do. One of them, for example, caused the engine to turn off. You can imagine what might happen if you pressed that one while doing 90 on the highway. The driving experience? There certainly is one. Based upon personal experience I can say that the Lexus is “a cut above” the 1992 Dodge Aries, which is the last car that I owned. The contoured seating of the Lexus offers a level of comfort not found in the Aries, and the powerful acceleration that the Lexus provides with the merest slam of the accelerator could almost certainly defeat the Aries in a one-on-one drag race. The Lexus speedometer went up to 200. The fastest that I personally got it up to on the streets of Brooklyn was about 35, but I have no doubt that it was capable of double or even triple that, were you to take it out to the salt flats. If you are looking for a vehicle that offers the feeling of the wind in your face as you sit back and zoom down the road, this Lexus qualifies. I will only note in passing that a recumbent bicycle qualifies as well. The best form of transportation here in New York City is walking, followed by the subway. The third best form of transportation is “a car that someone else is driving for a small fee.” The idea of driving yourself around New York City in your very own car is absurd. Yet this is the hell that I was forced to suffer for an entire weekend. It was against regulations, I was told, to park this precious Lexus on the street, meaning that I was forced to stash it in a parking garage all weekend, at a cost equal to or exceeding that of the Lexus itself. Just as well, because the one thing that parking spaces on the street in Brooklyn all have in common is that they are currently occupied by other cars. They also often require “parallel parking,” a dangerous maneuver that I do not advise, lest you start banging against bumpers and end up getting shot. These things happen in the big city. The harrowing 20-minute ordeal of making my way to IKEA resembled a life-and-death game of “Frogger” more than a relaxing drive on a summer’s day. Though these contemptible unsafe and congested conditions cannot be directly blamed on the Lexus corporation, they can certainly be indirectly blamed on the Lexus corporation, and all other car companies that clog our urban streets with automobiles in the same way that the Burger King corporation clogs our arteries with cholesterol. The next time you are stuck in slow-moving traffic, I urge you to pass the time by reading over the New York City strategic transportation plan, a document full of common-sense ideas for lessening the impact of cars in our fair city. “Why can’t we pass a strong congestion pricing plan to discourage driving in our urban core?” you may wonder as you leaf through the printout, glancing up occasionally to check for obstacles in your path. “Why don’t we just tax the hell out of gasoline and pour that money into upgrading the MTA’s infrastructure?” you may ask yourself as you jerk the wheel to avoid a dead bicyclist. Nothing will make you wish for a comprehensive plan to eliminate driving in New York City more than driving in New York City. Upon my safe (thank god) return from IKEA, I sensibly stashed the car in the parking garage for the remainder of the weekend. How I yearned to be free from its metallic yoke! This vulgar Lexus costs more than $85,000. I am not one to tell people how to spend their money—I will leave the rants against needless luxury goods to the angry American underclass that will surely come beating down your door all too soon. I will simply note that instead of buying this Lexus, you could invest the purchase price in conservative financial instruments and, in 35 years, have enough money to purchase an entire city bus for the MTA. What a lovely legacy that would be—the one vehicle that actually deserves to be on our city streets, plying its sensible route thanks to your kindness. Or, you could buy an ugly car that will be in a landfill by then. The choice is yours. I’m told the Lexus has heated seats, but I couldn’t figure out how to turn them on.